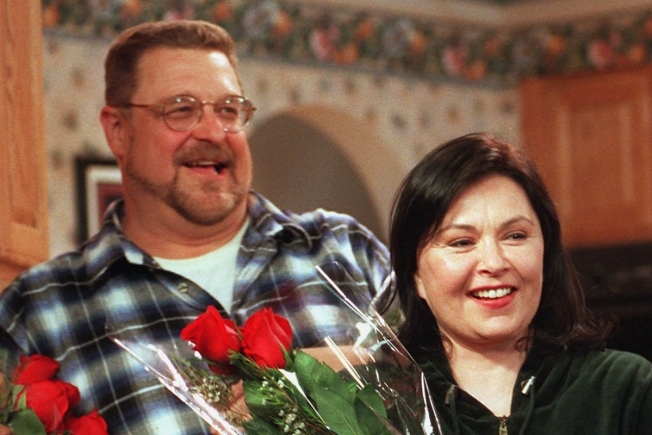 Comedienne/actress Roseanne, right, star of the longtime ABC sitcom "Roseanne," basks in applause with co-stars John Goodman, left, after taping was completed on the final episode of the show on April 4, 1997, at Radford Studios in Los Angeles. "Roseanne," one of TV's rare working-class comedies, will return to ABC two decades after it wrapped its hit run and with star Roseanne Barr and the rest of the cast intact, the network said Tuesday in announcing its 2017-18 season plans. "The Conners' joys and struggles are as relevant — and hilarious — today as they were then, and there's really no one better to comment on our modern America than Roseanne," ABC Entertainment President Channing Dungey said in a statement. The original series wrapped its nine-season run in 1997. Besides Barr as the Conner family matriarch, the eight-episode reboot airing in 2018 will feature John Goodman as her husband, Dan, along with former co-stars Sara Gilbert, Laurie Metcalf, Michael Fishman and Lecy Goranson. Sarah Chalke, who played Goranson's character, Becky, in later seasons, will appear in another role, ABC said.